Beautiful sites with paved patios and easy access, close to all that DFW has to offer. Only 3 minutes to Texas Motor Speedway and 15 minutes to Fort Worth and Denton. Book your long or short term stay now. I would definitely not recommend this facility. We were confronted by a pounding at our front door at 8 am to move our vehicles so they could trim trees. No advance warning. When I said I would move them later, Mgmt threatened to have them towed! We are bombarded with constant back-up alarms, weed eaters and blowers from early morning to late afternoon. Mgmt is extremely rude and don’t care if you have a complaint. Extremely expensive. WiFi doesn’t work. Water goes off unexpectedly with no warning. Go elsewhere it’s not worth it!! We booked this stay based on the Good Sam rating of 10/10/10. Having visited many other 10/10/10 parks, we were very disappointed. The park obviously hasn't been rated in years. This is nothing more than a trailer park with 98% long-term residents. There are tremendously huge speed bumps that we took very slowly, yet they still managed to knock our refrigerator out of its space. The trash is a site by site pickup from Waste Management (just like a mobile home park). Many of the sites are highly unlevel and not appropriate for large motorhomes. Fortunately, they did accommodate us with a level site. All sites are back-in, no pull thrus are available. This park is a 100% pre-pay in advance, regardless of when you make the reservation. On a 1-10 scale compared to other parks, this park should be more like a 4 and a $20 rate (not $59). We would only stay here again in an emergency. We stayed here 5 nights and were very pleased with every aspect of the park. The sites are level gravel, surrounded by a spacious concrete surface. WiFi and cable aren’t great but the overall condition of the park is excellent. It appears that there are many permanent or long term residents - unlike most parks with similar arrangements, everyone’s site is well maintained. It’s near the highway(s) but very quiet. The bathrooms aren’t fancy but they are private and clean. We will stay here again. We had a great stay at this park. We were part of a large group (five RVs) in town for a youth baseball tournament. The park was able to put us all together and close to the pool and restrooms. Restrooms were pass-coded and very clean. We had about 10-12 kindergartners running around the pool and grass area nearby and no one had any issues (that we know of). 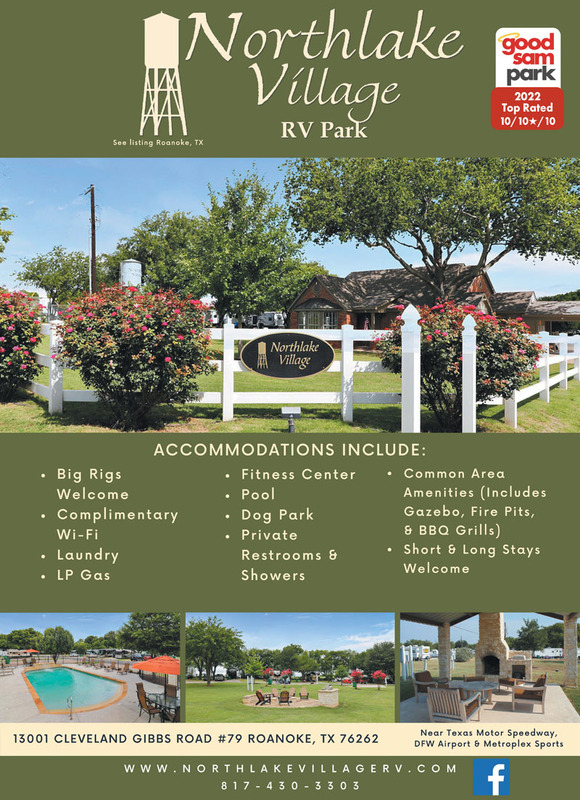 Clean park, close to restaurants, shopping and Texas Motor Speedway. We would definitely come back! 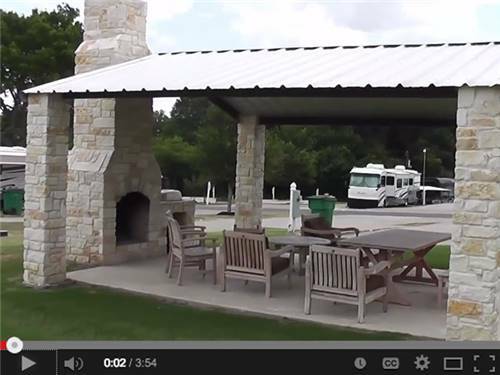 What a beautiful and well maintained RV park. This hidden jewel of a park is quiet and no train or traffic noise, but only a mile from Texas Motor Speedway, Bucees, and the Outlet Mall. The sites are gravel but had even been raked, and there was not even a scrap of trash anywhere. There were trashcans at most of the sites, instead of an ugly smelly dumpster. A beautiful covered pavillion with a large table is located near the pool, with other tables on the greenway, and at the newly opened dog park. We will stay there anytime we are in the area, and appreciate the polite staff and excellent service during check in. This is a very expensive park for the experience. The RV sites are not level indicating a lack of proper care between visitors. The spaces are close together with no attempt to provide screening. Further there is no cable provided by the park. How could this be rated a perfect 10? For the money and the Good Sam rating, we expected much more. The RV spots in this park are very, very small - and are NOT level. There is no outdoor table provided and no level place to put your own table. The laundry facilities are very limited (5 machines for the entire park) and the facilities are closed for cleaning at random and high peak times. The management moved our outdoor items when we were away from the site...without care or consideration. The "no refund" sign is the most prominent feature on the "welcome desk." Management is very inconsiderate of the needs of their guests. 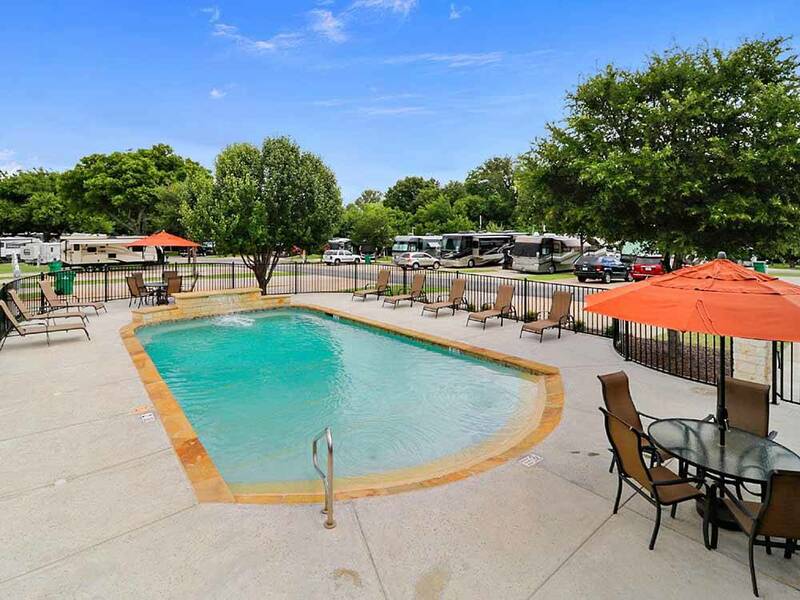 This could be a beautiful facility - however, the property has been divided into the greatest number of RV spots, instead of consideration for the views or quality of experience for the guests. We will not be returning to this facility. This is a nice park, but definitely not 10/10/10. The park was attractive and well located, although it was a little hard to find. Most sites were occupied by people living there which should not have been a problem except everyone going and coming passed the sites reserved for short timers, as we were. Some of those people left early to go to work and had loud pipes. WiFi was at best very spotty. It should not have been advertised as having WiFi because it was barely usable even though we were close to the office and a repeater. It was somewhat overpriced considering most of the time the Wifi wasn't usable. Very nice park. Well maintained and quiet. I have two complaints. First, the wifi didn't work at all for us and we were right by the office and pool. Secondly, we had no cable TV at our site. There were sights close to us with cable, but not ours. Of course, I didn't find this out until we were already set up. I guess I shouldn't have assumed that when they said they had Wi-Fi and Cable, they didn't mean all sites. Otherwise, we really enjoyed our stay. Pros: Very nice campground, comfortable, great pool Cons: kind of tricky to find it but once there you will be pleased. It would be a good idea to call ahead of time for instructions. We had to call because we couldn't find it. Staff - ok because when we got there I told the lady that it was tricky to find the place her comment was "some people have better GPS" instead of being apologetic . I didn't like the comment nor the attitude. In addition, we had to leave a day before we had planned and they told me there would be no refund - I didn't like that either. I will contact the management company in regards to that as soon as we get home. Wifi - like any other RV park - so,so. As I mentioned in another review, I will not give 5 stars to any campground that does not have an acceptable wifil. We didn't use the restrooms neither the laundry. Northlake is sufficient but all 10s is a stretch. There is a lot of construction happening just outside the campground and the road is "pothole central". I know this isn't the campground's fault but it is a factor. The office closes at 4 pm. We arrived closer to 6 pm and didn't think we were going to get our spot. I called and left a message so miraculously, our reservation information appeared taped to the office door. We had already checked the door once and it was not there. The park is very quiet considering the number of people and the close proximity to the other sites. All in all, it was a good experience but I think Good Sam has it a bit overrated.